HFO Investment Real Estate (HFO) is pleased to announce the sale of the Village Fair Apartment Homes, located at 309 NE Fairgrounds Road in Bremerton, Washington. Located immediately south of the exclusive suburb of Silverdale, Bremerton is buoyed by the Navy’s Bangor submarine maintenance facility which employs approximately 6,000 of the county’s more than 260,000 residents. Bremerton is connected to downtown Seattle by ferry – a 50-minute, 17-mile trip that operates every 60-90 minutes for 18 hours each day. Completed in 1984 with renovations beginning in 2010, the Village Fair Apartment Homes attracted the attention of investors from throughout the country, including Alaska, California, and New York. 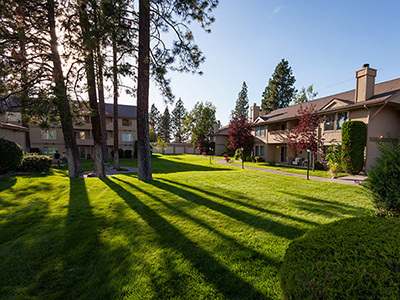 Located in an attractive, forested setting, Village Fair Apartment Homes offer a diverse mix of one- two- and three-bedroom apartments featuring fireplaces and decks with views of woods or a landscaped courtyard. HFO partners Cody Hagerman, Tyler Johnson, Rob Marton and Greg Frick represented seller Tucci Investments in marketing the property nationally. Village Fair garnered immediate interest from investors throughout the U.S.—especially in Alaska, California and New York. The property ultimately sold to New Standard Equities of Los Angeles, California, a real estate investment & asset management firm. “More than forty of the units at Village Fair had been renovated in the past few years, and the ability to continue adding value to the property during a time of increased demand for housing was especially attractive to the buyer,” said HFO partner Cody Hagerman. Village Fair Apartment Homes’ many amenities include an outdoor pool and sun deck, clubhouse, a BBQ picnic area and kids play area. The sale represents a price per unit of $112,500 or $130 per square foot.